The Division is a game that I’ve got mixed feelings about. I bought it on release because I genuinely was intrigued by the style of gameplay it offered. I still genuinely like it, because while it does feature the same open world trappings of That Ubisoft Game, it’s atmospheric and I enjoy teaming up with friends. 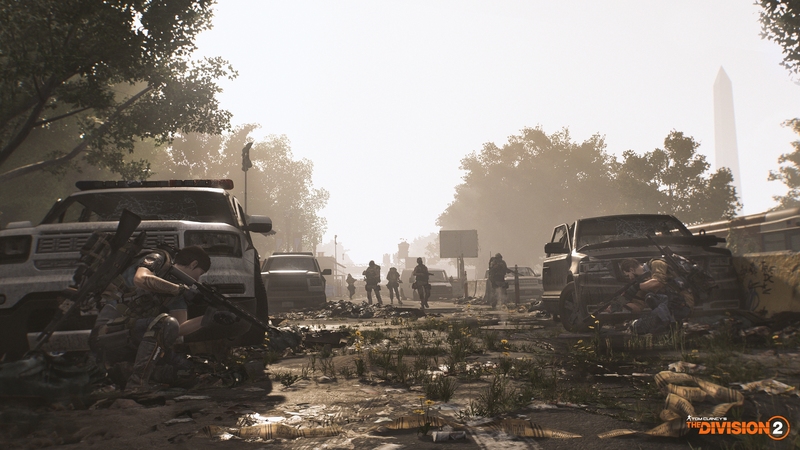 Going by the world that was described to me at Gamescom and I was shown at EGX, I can imagine The Division 2 is considerably better than I was first expecting. However, I still have a few niggling doubts. Part of this comes from the gameplay itself. During EGX I was able to team up with three other players, fight my way through one building on my way to the crashed Air Force One, on what I think was a rescue or recovery mission? Honestly, I don’t know – I was too busy talking absolute rubbish with the other three players. All I needed to know was that when we reached the plane, one of us had to launch a flare to call in support. Launch the flare we did. Or at least one of the others did, I was too busy finding myself either being rescued from near-death or rescuing somebody else from near-death. Either I’m out of practice or The Division 2 is somewhat more difficult than the original. I will say that the movement of your character, sounds and views of the battlefield feel that much more effective here in the second game. Granted, the enhanced visuals and audio design are clearly the major factors behind this. What didn’t seem too different was the ebb and flow of battle. It’s all too easy to find yourself sneaking forward, dashing from one chest-high-wall to the next, and just popping your head up to take shots at whatever enemies you can see. Though I do have to say, the AI already seems more intelligent than in the first title. I foolishly let myself get split off from the others – multiple times – and enemies were quickly adapting to my position, flanking me or flushing me out with grenades and other similar weaponry. 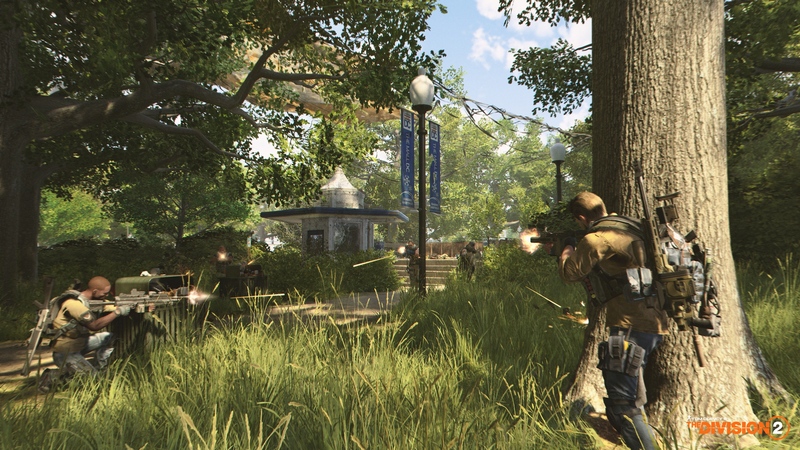 There’s something that feels clean and fresh about The Division 2, despite how messy the game actually is. It certainly felt easier and looked cleaner, with parts of the user interface being scaled back to let you see more of the game without the overlay of orange lines found everywhere in the first. It felt solid and fun, it’s an action movie in game form. It makes perfect sense that missions would be like this, ramping up the action and the ostentatious display that comes with it. Just how many of these missions will be about fighting through to secure and capture an area I can’t say. I’m genuinely hoping that there’s a bit more of a balance, but in reality, there’s only so much one can do with such a setting. What I do know is that you’re no longer shooting through the dark streets of New York, now you’re in the sun-drenched streets of Washington DC, seven months later. While I was at Gamescom the setting was the core focus, being described in a close to 30-minute presentation. It’s something I haven’t covered up to now simply because I genuinely wasn’t too interested in explaining the new setting in The Division 2. Not without having at least played the game to offer a frame of reference anyway. Thankfully, I have now – even if it was only around twenty minutes. I can’t say I saw a great deal of Washington DC as represented in the game while actually playing, though what I did say seemed to offer a bit more variety than we saw in New York. That’s understandable as the city is actually built upon a tidal plain – not a swamp as rumours indicate. This does mean that the city, should infrastructure collapse, would soon find itself with more water than is expected – primarily from the Potomac River, with some help from the Anacostia River. It’s the use of this setting that should truly aid the game. Wide open spaces, using the treeline as cover, rather than blocky high-rises will enhance both the aesthetical and tactical qualities of the game. Already when playing, with the more open areas around the crashed Air Force One, I noticed the game has much more space to play with. It’s something I’m looking forward to exploring, particularly considering Ubisoft have stated The Division 2 has six distinct environments. These can be divided into two areas in reality: built up and not built up, with some in-between. Suburbs, Residential and Commercial are three environments that are more built up, to varying degrees. It will help to offer variety compared to New York which featured big buildings, big buildings and even bigger buildings. Nature represents the not built up area, focusing around areas that have been reclaimed by the environment. Trees, water and animals will enhance the world and offer something new to see. Finally, we have Government and Historic, where you’ll find such as the White House and the Lincoln Memorial, though as in real life, there’s a lot of free space around these areas for nature to reclaim. 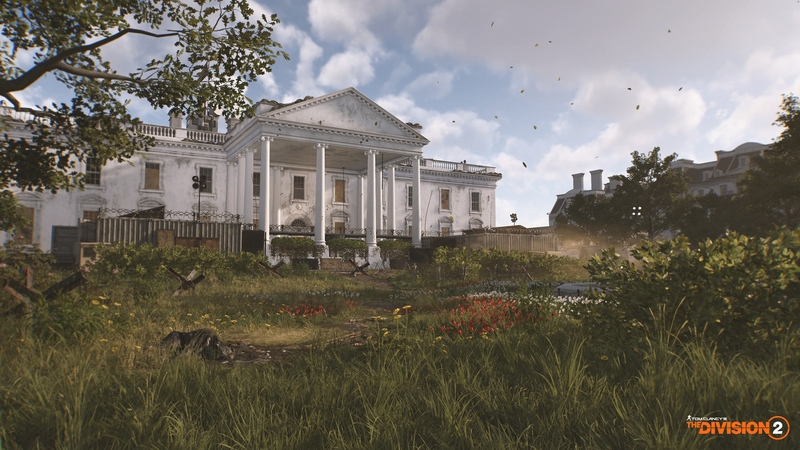 While not the full city, Ubisoft Massive have made a 1:1 recreation of the core area of Washington DC and also made the effort to explore and recreate the major monuments and buildings themselves. This includes the Oval Office and the Capitol Building. More than that, a huge level of research went into the audio of the city, with the developers placing high definition recorders throughout the city at night time. This will avoid the noise pollution caused by normal traffic and help to bring in the true nature of the nation’s capital from mosquitos to the and other fauna, as well as the rain and running of the river. 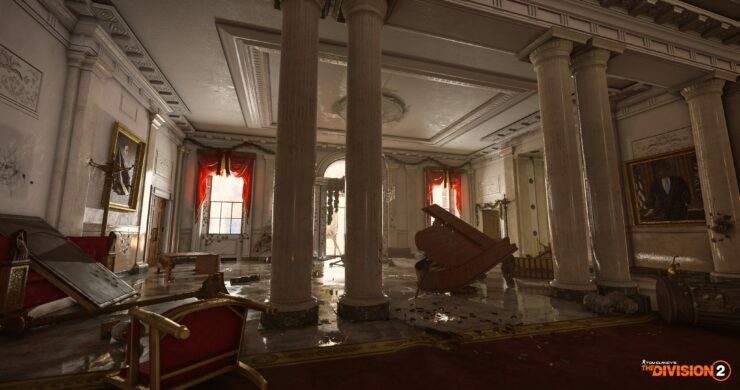 It’s this purported attention to detail that I hope will help Ubisoft achieve the aim of making the city feel like a character of the game. It’s no secret that I’m a critic of Ubisoft’s usual fare in their titles, with the worlds being all too bland with no real life of their own. The Division 2 and the effort that has seemingly gone into it could finally be the title that breaks the streak and I’m more than looking forward to trying it out. 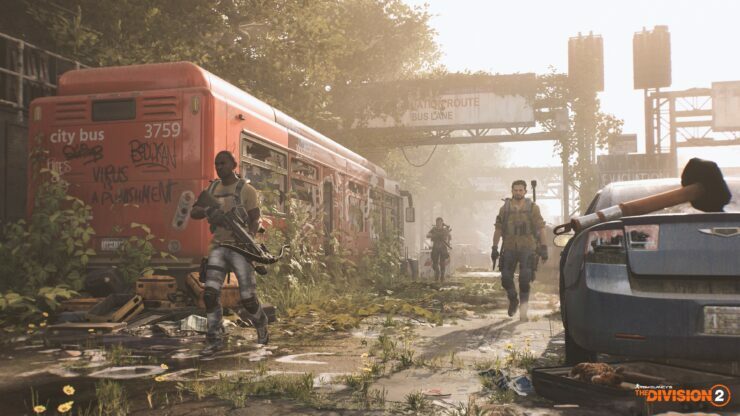 We’ll find out for sure when The Division 2 launches on the PC, PlayStation 4 and Xbox One on the 15th of March, 2019.